Over the next few weeks, we met with two different sets of maternal-fetal specialists and pediatric cardiologists to narrow-down the diagnosis, to discuss our options, and to try and answer all of the questions we had on variations of Hypoplastic Left Heart Syndrome, a complex, single-ventricle defect. We went about living our everyday lives as normal as we could for Jean-Luc, our precious then-3-year-old little boy, although the pain in our hearts was sometimes unbearable. We prayed every day and had our families, friends, and friends of friends also praying. We needed a miracle! We had three options: (1) Abort, which was not an option we even remotely considered; (2) multiple open-heart surgeries over a few years, which we researched endlessly; and (3) comfort care, which we ultimately decided on. One statement from one of the specialists still sticks with me today. While discussing the surgeries our baby boy would have to endure due to the scope and magnitude of his many defects and “missing parts,” he said, “I do feel like we would be doing something TO the child instead of FOR the child.” Even though our decision for comfort care was made, as the parents of one healthy little boy and my carrying in-utero another precious little boy with a “broken” heart, we both prayed for peace with our decision and placed our baby in God’s hands! The next few months were a blur. As you can imagine, we were living day-to-day, praying, and crying often. It was a time of unspeakable sadness. 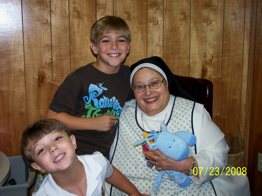 We met with our parish Priest for an Anointing of the Sick, and we also met with Hospice to discuss the role they would play once we brought our little boy home from the hospital – he was not expected to live beyond a week. My husband, Andre’, also met with our Church to discuss funeral arrangements, including a burial plot adjacent to the Church. I remember walking in to meet Sister on our initial visit and one of the first things she said was, “Why are you taking steps to bury your child…he’s not even born yet!” She could not have known Andre’ had just went to St. George and to Hospice a few days before to make those arrangements. Indeed, because of our grief, we hadn’t told anyone what we were doing. It was now mid-October – I was due November 12th – and we met with Sister once a week for the next four weeks. She layed her hands on my belly and talked to Papa. She said that Papa wanted to know if we accepted His will in all of this and we answered, Yes. She told us a lot, but the most important things were that our son was going to be fine; we would see him grow up; she could see his beautiful blue eyes; that things would get worse before they got better, but to keep praying and always trust in God. She told us that our son wouldn’t be a professional athlete, but he’d grow up to do the things most other kids do and that we should steer him to the arts. We left our initial visit with Sister blessed with an inner peace – the Peace of God – that I can’t even describe and which we carry to this day! It was a true blessing. I remember her telling us to rejoice and be happy with my pregnancy – and from that day, we were! We trusted God would take care of us and we trusted in the words Sister told us. BUT, we still questioned things sometimes. We didn’t know at that time that Sister Dulce had been given a healing ministry from God, and we wondered how the doctors could be wrong. We believed in God’s grace and had accepted His will, but we still thought, many times, how could this be. We were torn between what our hearts were feeling, what our minds were thinking, what the doctors had advised us, and what Sister had told us. On November 12th, our beautiful baby boy, Jean-Paul Laurent Bourgeois, was born and we were blessed to have a very large contingent of family and friends at Woman’s Hospital, all of whom thought this might be their only chance to see and hold Jean-Paul before he died. After an agonizing length of time, several hours of tests and studies, our pediatric cardiologist finally came into our room and said, “Things have changed; I’m not sure how to explain this, but your son has a few more ‘heart parts’ to work with and if we fly him to Ochsner in New Orleans and do the staged surgeries, he’ll be okay.” I am sure Andre’ and I both had a stunned look on our faces when the doctor said, “Now, he won’t be a professional athlete…” Andre’ and I looked at each other and thought, Sister told us that precise phrase about a month ago! A medical flight team of specialists came to the NICU and hooked up our brand-new baby boy to all kinds of machinery in order for him to fly to Ochsner in New Orleans. We were filled with joy, sadness, and, truly, some confusion as well. We were trying to process everything our pediatric cardiologist told us, as well as trying to piece together all of the information Sister had told us over the past four weeks as we held hands and silently just watched the helicopter disappear to nothing but a dot in the sky. Jean-Paul had his first open-heart surgery at six days old and immediately had complications, which led to three other procedures and surgeries in the first few weeks of his life. His first surgery lasted about eight hours and, while the doctors were wheeling him past us to the PICU, his heart stopped! They had to rush him into the PICU, create a surgical suite on the spot, and then re-open his little chest that they had spent the last two hours closing! Yet, we remembered Sister told us that things would get worse before they got better, and although we were anxious and worried about our newborn baby going through so many open-heart surgeries and medical procedures in the first few weeks of his life, we continued to put our faith in God, and Jean-Paul was discharged about six weeks later. The date was December 22nd, our older son’s then 24th birthday and just in time for Christmas. It was the best Christmas present Papa could give us! Jean-Paul had another round of surgeries at only seven months of age, and we called Sister when he was going through some serious problems (another post-surgery complication requiring an immediate follow-up corrective surgery), and she put us at ease and told us to continue to pray and trust in Papa. He was discharged after only eleven days in the hospital. It was around this time that Andre’ and I began to reflect on how much our lives had already been forever changed. We began to more-fully realize and understand that God gives you what you need; not what you want. In Jean-Paul’s case, He gave him enough “heart parts” to work with, and, for us, the gifts of faith, trust, and peace. Things were going pretty well at this point and, around a year later, I began to volunteer at the Sister Dulce Ministry Center, and Andre’ began volunteering as a Board member of the Sister Dulce Foundation doing whatever Papa needed him to do. What a blessing that became. I so looked forward to my one-day-a-week of volunteering and, although visitors said we brought them joy and smiles, they did more for my faith and me than I could ever imagine having done for them. It wasn’t really until then that I ultimately grasped the gift that Papa has given to Sister Dulce. Being able to see the miracles that literally took place on a daily basis forever changed my life. Jean-Paul continued to thrive, but in July of 2007, at 3 years of age, it was time for his final-staged surgery. Our lives were good, the emotional scars were healed, and neither of us cherished having to undergo the hospital gauntlet so soon again. His cardiovascular surgeon had left New Orleans after Hurricane Katrina, so we now had to find a new surgeon to care for Jean-Paul; thus plans were made for his surgery at Boston Children’s Hospital. We ultimately returned to Boston Children’s Hospital this past summer for some repair work to Jean-Paul’s heart, but it was our shortest stay ever…one week. Hooray! What can I say other than our faith has grown so much in the past six and half years. We have been blessed to have been given a child with a heart defect; yes, blessed! He has changed our lives, and with his own little “broken” heart, he has touched the hearts and souls of countless others. We tell his story with the hope that those who read it will be inspired and grow in their faith. We all have crosses to carry. Some are heavier than others. But, when you ask God for help and accept His will, sometimes the cross is removed, but always, by His grace, the cross becomes lighter. 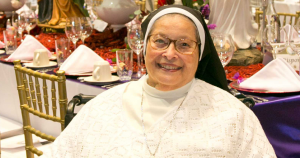 Without Sister Dulce and the birth of our miracle baby, we would not be where we are in our spiritual life. She has taught us so much about how to have a relationship with Papa.